Mountains love dressing up in clouds. They wear them over their rocky slopes like delicate, flowing robes of moisture. 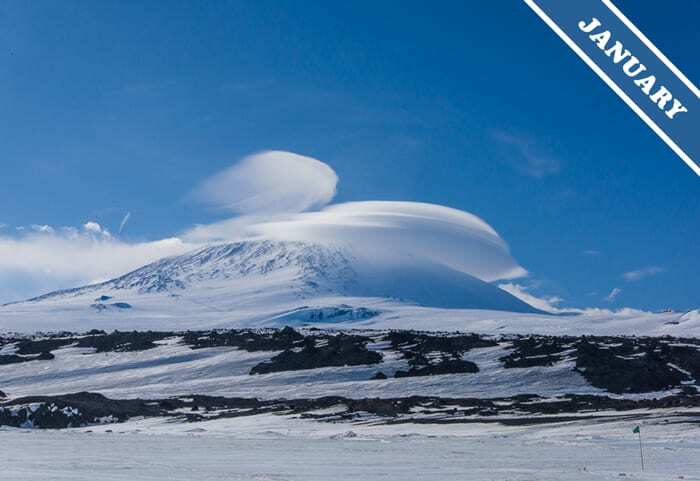 Mount Erebus in Antarctica is the world’s southernmost volcano, and it’s shown here greeting the New Year sporting three elegant cloud formations: the lenticularis cloud, the cap cloud and – destined to become the must-have alpine accessory for 2016 – the banner cloud. All three are known as ‘orographic’ clouds, which means that they form as a result of the wind flowing over raised ground. As the air rises to pass over the topography it cools, which can cause some of its moisture to condense in to droplets and appear as cloud. The lenticularis formation is the one appearing up above the peak of Mount Erebus. This cloud type tends to look like a flying saucer, and usually appears near mountain terrain, forming on the crest of an invisible standing wave of air. The cap cloud is the one on the right side of the volcano’s peak. Cap clouds more commonly appear balanced symmetrically on the mountaintop, but Erebus clearly prefers to wear its cap at a jaunty angle. And then there’s the banner cloud. This is the trail of cloud just visible extending from the volcano to the left of the photograph. A banner cloud often looks like a scarf billowing in the wind. It results from the horizontal vortex of air that can develop downwind of the peak. When this vortex draws moist air up from the slopes below, the air cools and so can condense into droplets of cloud, which appears as a banner behind the mountain summit. Here’s to the cloud-clad mountains of the world! Thanks for sending the link, Bjoern. I’ve tweaked the banner cloud wording to be better in line with the evidence from that paper.